Preheat oven to 160C/gas mark 3. Add dried fruit and stir in well. Stir in enough Guinness to make a soft dropping consistency. Bake for one hour then reduce to Gas Mark 2/150 C and bake for a further 1.5 hours. Allow to cool. Remove from tin and turn upside down. Prick all over the base with a skewer and slowly pour rest of Guinness onto/into the cake. Keep cake wrapped and upside down for at least a week. 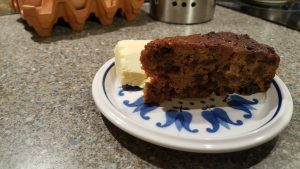 This makes a wonderful Christmas cake (I never put icing or marzipan on it) and must be eaten with Wensleydale cheese! The addition of spelt flour adds texture and taste to these rolls. I make the dough for the rolls using the bread maker. Although this takes longer than making it by hand (around 3 ¼ hours in my machine) this produces a good quality “smooth and silky” dough which is easy to handle. Weigh the ingredients and put them into the bread pan in the correct order for your machine. Insert the bread pan into the machine and close the lid. Select the “wholemeal dough” option and the appropriate size (for my machine this is a large loaf). When the program has finished turn the dough onto a lightly floured surface and knead very lightly to knock the air out of it. In the meantime heat the oven to 2200C (Fan 2000C). When the rolls are ready put them in the oven and cook for about 15 to 20 minutes until they look done and sound hollow when tapped. Transfer the rolls to a wire rack to cool. If you prefer a soft topped roll cover them with a damp cloth for the first 5 to 10 minutes. This is the basic recipe but you can vary the type of rolls produced, e.g. 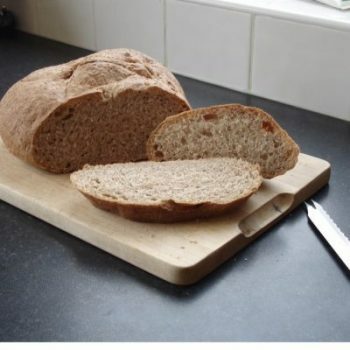 leave uncovered during the cooling period to make a crusty roll for use with soup; add a dessert spoon each of poppy, sesame and sunflower seeds to make a seeded roll; replace half of the strong white flour with Holgate strong wholemeal flour to give a slightly heavier textured roll etc. Put the flour, salt, pepper, baking powder and seeds into a mixing bowl. Add the live yoghurt and lukewarm water a little at a time gradually working the mixture until you have soft sticky dough. (As the dough can be quite messy to handle I usually use a knife to start the mixing and then finish off with my fingers, dusting them with just a little flour to help prevent the dough from sticking too much. Don’t add too much flour to your hands though or you will spoil the consistency of the dough) . Cover the bowl with a damp tea towel and leave in a warm place for one hour. As there is no yeast in it the dough will not rise, but this ferments the dough and gives it flavour. After one hour tip the dough out onto a lightly floured work surface, dust your fingers with flour and divide the dough into eight roughly equal portions. 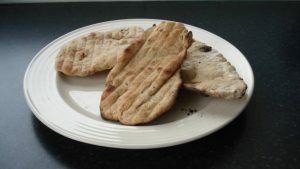 Note – Naan breads need to be cooked quickly under a very hot grill so at this stage I usually turn on the grill, but the timing will depend on how quickly your grill heats up and how long it takes you to work the dough into naans. Flatten and stretch or roll each of the pieces into an oval shape about 10cm long to make eight naans (I sometimes use a rolling pin to help stretch them but with very light pressure). Cook under the grill for 1 to 2 minutes on each side until they puff up and become lightly browned. Remove from the grill and brush with the melted butter and garlic. These biscuits are very easy to make so good for children. Makes about 18 biscuits. Oven at 200C. Cream margarine and sugar together until light, then add egg yolk. Add Holgate Windmill flour, cornflour, spices and mix into the creamed mixture. Add enough milk to make a pliable dough, then mix in currants and peel. Roll out dough to about 1/4 inch thick and cut into rounds of approximately 2.5 inch. Put on a baking tray covered with baking parchment. Bake at 200C for 10 mins. Lightly whisk egg white, brush over biscuits then sprinkle with additional caster sugar. Return to the oven for 5 mins or until golden. Cool. This loaf is made in two stages beginning with a ‘pre-ferment’ which is made the evening before. 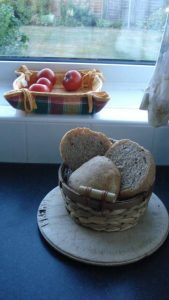 The longer rising period helps the loaf to develop more flavour and reduces the amount of yeast that needs to be added. Stage 1: To make the pre-ferment put 150g of the wholemeal flour and 100g of the strong white flour into a baking bowl together with all of the yeast and 250ml of the water. Mix everything together using your hand or a metal spoon until it forms a thick sticky lump-free mixture, then cover with either a damp cloth or cling film and leave to rise overnight (approximately 12 hours). Stage 2: The next morning pour the remaining 75ml of water into the pre-ferment (which should by now look ‘bubbly’) and mix it until you have a smooth batter. Then slowly work in the remaining 250g flour with the salt and the butter to make a soft dough. Flour the work surface, turn out the dough and knead it for 10 minutes or until it is stretchy and pliable. Place the dough in a bowl and cover with a damp cloth or place it in a tightly sealed plastic bag for around 2 to 3 hours until it has doubled in size. Stage 3: When the dough is ready, line a baking tray with greaseproof paper. Take the dough out of the bowl, punch down (knock back) the dough with your knuckles to deflate it and knead it gently for one minute. Shape the dough into a ball, and place it on greaseproof paper on a baking sheet. Cover with an upended baking bowl and leave to prove for 1 to 2 hours. (If it leaves a slight imprint when you press your fingers into it then it is ready for baking). Stage 4: When the dough is ready, slash the top with a knife and bake it in a hot oven (250C) for around 30 minutes. To test if the loaf is done rap the base of the loaf gently with your knuckles – it should give a hollow sound. Take the loaf out of the oven and leave to cool. In a large bowl mix the caster sugar and rhubarb together and put on one side. Stir the oil, egg, vanilla and milk into the rhubarb, then add the flour, baking powder and bicarbonate of soda and stir well. Spoon the mixture into muffin cases (makes approximately 12) then scatter with a thick layer of the crumble mixture. Cool before eating. They are also good with the addition of some crystallised ginger. Heat oven to 180C. Line a baking tin, about 8 inches square. Melt butter with sugar and syrup. Remove from the heat, add in chocolate and mix well until the chocolate has melted. Whisk in eggs one at a time and then stir in the flour. Remove from heat, cool and refrigerate overnight. Do not be tempted to cut it before it comes out of the fridge as it will not cut smoothly. Use a wet knife to cut into small squares. This tastes amazing cold but is also fantastic warm with ice cream! This recipe makes about 8 medium pancakes. Mix the flour, milk and egg and whisk well, preferably with an electric mixer. Leave to stand for an hour or two as the wholemeal flour takes a bit more time to soak in. Eat with any of the following, sugar, lemon, golden syrup, honey or jam. This is a very versatile mixture as you can keep it in the fridge for several days. You can also freeze the cooked pancakes, if making and freezing a large number, by separating with greaseproof paper or clingfilm. These pancakes are extremely good as a savoury dish. Roll them round a filling (savoury mince, mushrooms in cream cheese, ratatouille, fish in cream sauce etc.). Lay the filled pancakes in a lightly oiled baking dish, brush the tops with a little more oil and bake in a fairly hot oven for about 20 mins. Anzac is a word for a soldier in the Australian and New Zealand Army Corps from 1914 to 1918. Anzac Day (25th of April) is when Australia and New Zealand commemorate all the men and women who served and died whilst serving their countries. It marks the first major action fought by Australian and New Zealand troops during the First World War. Anzac biscuits were made by the women at home and sent to the soldiers abroad because the biscuits keep well and they do not spoil easily. Preheat oven to 180C/fan 160C. Line a baking tray with parchment. Heat the butter, sugar and syrup in a pan until sugar is melted. Add the flour, oats, coconut and bicarbonate of soda. Stir well. Form small balls in your bands (just a bit bigger than a golf ball) and place on the baking tray. Press down the tops to flatten. Cook for 8-10 mins or until golden brown. Line a deep 8 inch sponge tin and heat oven to gas mark 4/180C. In another bowl mix salt, cinnamon, flour and baking powder. Stir in the grated carrots and walnuts. Mixture is quite moist. Put mixture into tin and bake for 1 hour 15 minutes. Let it cool and when cold mix topping ingredients together (adjusting the amount of icing sugar so it’s not too soft) and cover the top of the cake with the icing. This is a delicious but very soft cake so it makes a great dessert, and it has also been used as a decadent wedding cake.